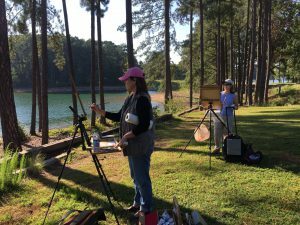 This past weekend started with teaching a 2 day “Plein Air 101” workshop, in Norcross, GA, at The Kudzu Art Zone. 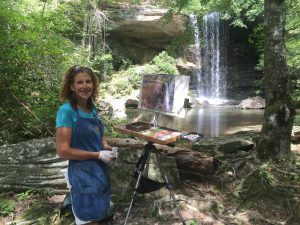 My class was geared to artists who always wanted to paint plein air, but were too intimidated or just never tried. 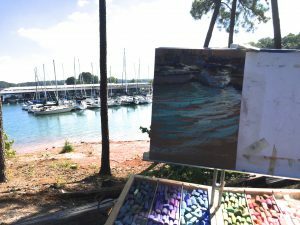 Painting outside can be quite overwhelming so it’s up to the artist to narrow down their focus and edit. One of the best ways to do this is looking through a view finder, that wonderful little plastic gadget that helps crop your view and and aids in determining your composition. I find if I can crop in, find a big dominant, interesting shape, use the area with the highest light to dark contrast as my focal point, I have a much easier time composing and designing, the key to a strong painting. 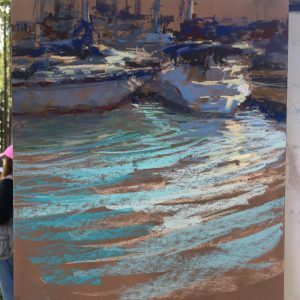 The class was chock full of information, from supplies and gear, simplification and editing, underpainting, color choices/color harmony, and tips and tricks to make your plein air experience easier and strengthen your outdoor paintings. 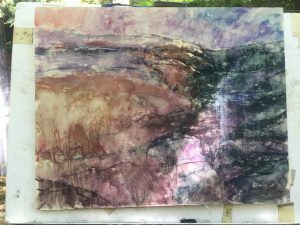 Because of the rain on Sunday, I even added a bonus….mounting and framing demo. 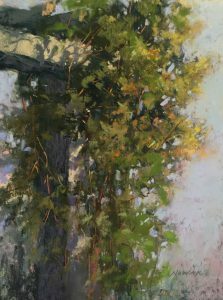 Here I narrowed down my focus to just one small area, the top of an arbor with cascading vines. Unfortunately, I didn’t take photos of the workshop. 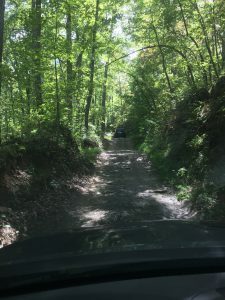 I was so busy teaching, I never took out my camera. 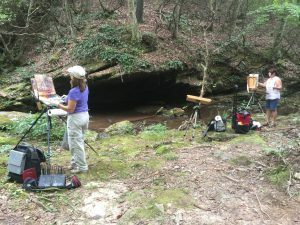 My dear friend and former pastel instructor, Barbara Jaenicke, came into town Monday to teach her own workshop in north GA. Luckily, her workshop isn’t till Thursday so we have been hanging out for the past few days and painting together with other artist friends. 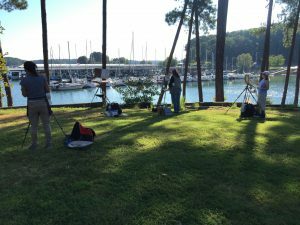 We are out in Lake Lanier Islands, at one of the marinas. Here’s Barbara Jaenicke with Donna Biggee. Jung Johnson is on the left. I wasn’t able to finish my painting of the boats but at least I got a good start. 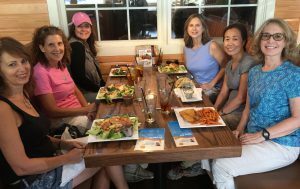 It was so much fun having our group all together again! Too bad we didn’t know anyone who owned one of those boats! Out to lunch where no one wanted to leave. 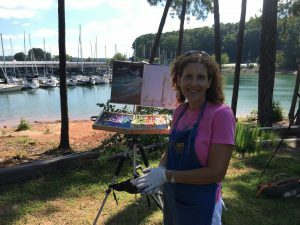 Today, Barbara and I painted up in Dahlonega. 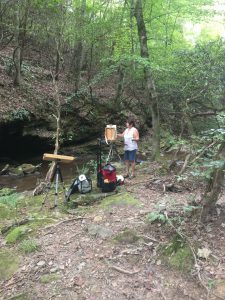 Anita Elder, owner of Art Loft, where Barbara’s instructing, and Amanda Lovett, another very talented oil painter, took us to a very secluded spot on private property. 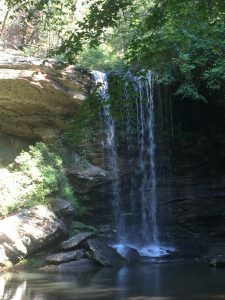 After a harrowing car ride through a narrow path and through a shallow creek, we ended up at this magnificent water fall. Well worth the drive! I took my own advice and honed in on just the top of the rocks and waterfall. It was very tempting to include it all, for it was ALL breathtaking. I reminded myself….Simplify and Edit. I really believe my paintings end up with much stronger compositions this way. Here’s my pastel under painting. Just played around with mixing up cool and warm tones into an interesting grouping of shapes. 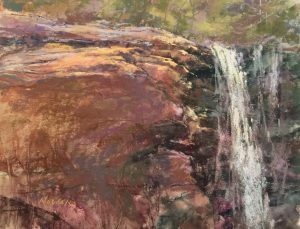 The Falls 11 x 14 pastel I stopped at this point, not wanting to overwork it.